Prior to No. 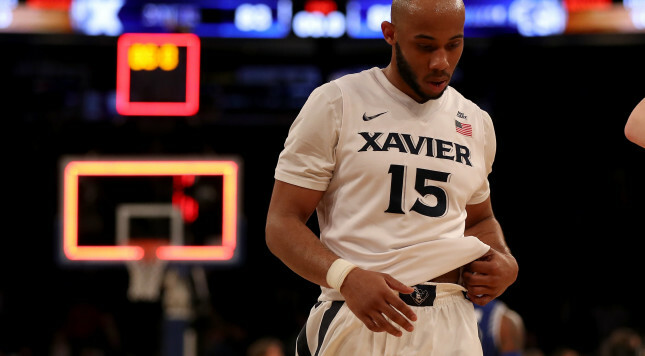 16/15 Xavier’s (13-2, 3-0 Big East) critical affair versus No. 1-ranked Villanova on Tuesday evening, the program welcomes back a familiar face. Head coach Chris Mack announced guard Myles Davis, who served a 15-game suspension due to two misdemeanor criminal damaging charges, will return to the rotation. A campaign ago, the then-junior ranked second on the unit in scoring with 10.8 points, along with a team-high 4.1 assists, per contest. Those efforts aided the team’s 28-6 mark, which ended in a heartbreaking three-point loss to Wisconsin in the second round of the NCAA tournament. Badgers’ guard Bronson Koenig sealed the upset with a three-pointer at the buzzer. Currently, the Musketeers sit No. 214 in the nation in three-point percentage (33.8). Considering the 6-foot-2, 187-pounder shot a healthy 38.1 percent clip from behind the arc last season, including four threes in a 90-83 win over the Wildcats, he’ll provide a much-needed boost in that category. Shortly after, Davis turned to Twitter to acknowledge Mack’s comments. While the conference features four quality teams (Villanova, Creighton, Xavier, and Butler) in the AP Top 25 and coaches’ poll, the addition of Davis should still give the Musketeers a shot at winning the Big East crown. A victory over the Wildcats would certainly help, too.